Vegan in Arundel you say? I don't know, maybe Arundel was closer to Brighton in my mind, but I just expected it to have more vegan options available.... people who actually knew what you meant when you spoke the word. But no. Just try a Google search for 'vegan Arundel' - it doesn't yield many results. Apart from one place - Gaskyns. I went to Arundel once before without having written the name of this place down and as Arundel is a fairly compact town and Gaskyns is (only just) on the way out of town, I couldn't find it. It's very convenient and easy to find if you know where you're looking though. As you can see on their website, they say they have vegan options on their menu. The term 'options' just scrapes through, with the two options available! They did have a specials board but on the day that I happened to visit none of the specials were even vegetarian... perhaps vegan options appear on some days?! The two options on my day were a bean burger and houmous on toast. Being rather hungry as I was, I didn't think some toast was quite going to cut the mustard, so I opted for the burger. The burger was okay. Just that, okay. I was a little surprised by what turned up on my plate if I'm completely honest. It was obviously homemade, as claimed, as it was a very flat patty of a burger and it was served in between two pitta breads. Not in between the slices of a single pitta, but just sat in between two whole pittas. I know I said I was hungry but I'll be all carbed out until Christmas now! There was a sprinkling of salad leaves on the side and two small pots filled with an onion chutney and homemade houmous, both of which were really delicious. I slathered the chutney and houmous between the pitta, topped with the salad and tried my best to hold these two pitta breads together without the patty falling out both sides. For £7.95 I felt it was a little on the expensive side seeing as it was essentially a sandwich and not really a full meal, but do you know what, at the end of the day I was thankful that there was a hot option available in a town otherwise barren for vegans. I also had a really good coffee with soya milk and a slice of the only vegan cake option available. I think it was a banana, date and walnut tea bread kind of thing, not really a cake. I wasn't actually even sure if there was any sugar in it, it was kind of crumbly and dry and at £2.50 a slice, I wished I'd just had a bit more willpower and gone without any cake. 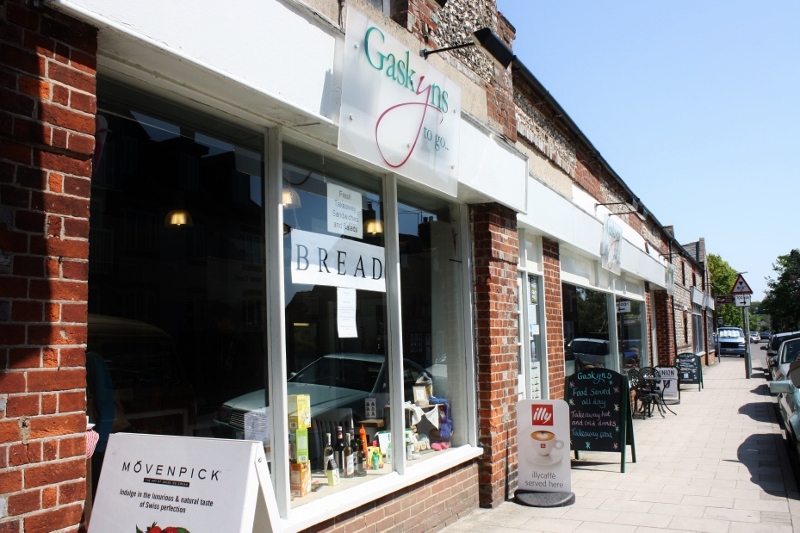 Gaskyns itself is a lovely little café, very comfortable and homely with art for sale on the walls and comfy sofas by the windows - perfect for relaxing on a sunny day. There is also a small health food shop attached, and as I said, if you're vegan in Arundel, it's probably your only bet.